A natural source of Phosphatidyl Choline (PC). Ideal to be taken by those following a calorie controlled, low fat, low cholesterol diet. Lecithin Granules are a unique product combining a range of well researched and documented beneficial properties. Lecithin is found in the lining of every human cell, performing numerous roles. Our Lecithin Granules are of the highest quality, containing no additives and are guaranteed to be produced from non-GM soya beans. Gluten free. Suitable for vegetarians & vegans. Optima Healthcare Lecithin Granules is rated 3.7 out of 5 by 35. Rated 1 out of 5 by Richk from Awful bitter taste I purchased two tins a month ago. The first had a bitter taste and left an after taste. I threw it away half way through and have now started the second tin. This is even worse and makes my porridge taste horrible. I leaves an after taste and even make my mouth feel sore. I have been using this product for 20 years and never experienced this before. Will not buy again until can be sure taste is back to previous standards. Rated 4 out of 5 by anni121 from Time to make the packaging easier to recycle I used to get a different brand of this called Lecigran which is now unavailable. This one is acceptable, but the texture of it seems a bit sticky, ie granules stick to the sachet of dehumectant in the container. Also the packaging is really hard to recycle the plastic lid is OK but the "tin" is actually made of a mixture of coated cardboard with a metal base which are quite hard to separate especially for someone like me with arthritic fingers. What's wrong with just a tin? Also the inner ring-pull lid is really hard to get off before you can start consuming the product. Improving the packaging would make a good product a great one! 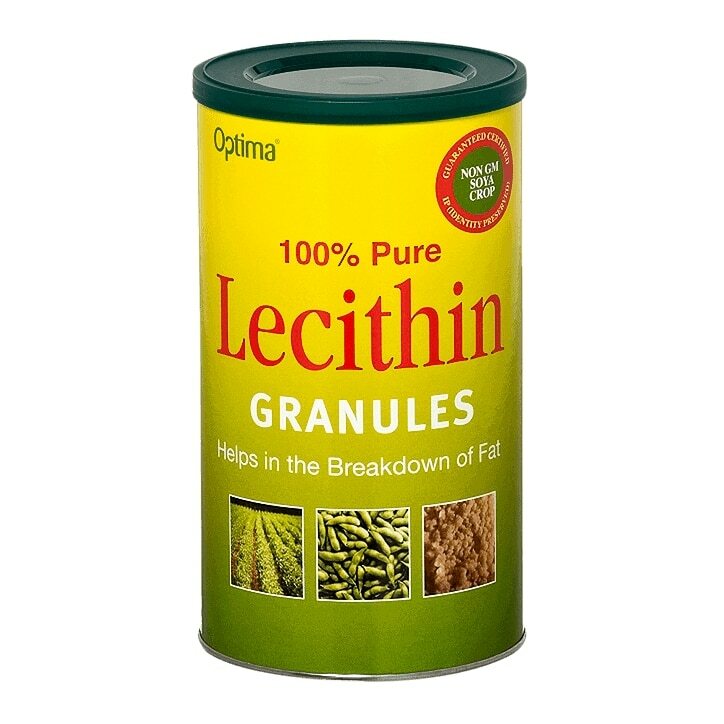 Rated 1 out of 5 by Worcshealth from Awful taste In the last few months this product has changed, I have been buying H&B lecithin granules for decades, but I shan't be buying another tin. The usual taste is pleasant and nutty, the last tins I have bought taste like laundry soap, very bitter simply inedible. Even mouthwash after doesn't kill the awful taste. Rated 1 out of 5 by Kiom from This Product Has Changed We have been using this product for the last 5 years, sprinkling 3 teaspoons over breakfast cereal or in soup. The latest tub is absolutely awful, it smells very rancid and oily. We notice that the design of the tub has changed slightly and don't know if the manufacturing process has changed as well. Definitely won't buy another tub until we know the reason for the change in taste.